Give me a reason to put a table setting together and I am ready! Come along and take a look at my Mother's Day Table Decor. Lets start with my bar cart. I love the idea of using a bar cart for so many other ways other than its original use of a bar cart. It makes the perfect beverage station of any type. I put this tougher with so many items from the Target Dollar Spot. I love the look of the water bottles and the little gold basket from Target and with a price tag of $3.00 its perfect. I was just in Target again this week and they still had several of these. I also remember they had them last Summer so it seems like something they like to bring back often. One of the new additions I put in place this past year was a coffee station and I absolutely love it. There is just something about going to your coffee station to make a fresh cup of coffee that makes it taste even better! This past week I stopped by World Market and feel in love this with hot tea cup which is an all in one set. I love the pattern and the look. I believe you should have things in your life that are pretty and make the day feel special. Make everyday special! My dish set is from Target last year and I have two sets of four and each set has four different plates in it which I love because it really adds style to your table. The pineapple candles from Target are my new favorite addition this year. I am so happy I was able to get my hands on four of them. I love adding small dishes like this one I picked up from Homegoods with the ruffles and at $3.99 its perfect to sit on the table and add that extra touch of pretty. This was another one of my favorite finds this year. When we took our recent cruise we stopped by a Homegoods and all three silver vases were in the clearance section for $5.00 each. I could not believe that amazing price and I had to pick them all up. My glasses are from the Pioneer Woman Collection from Walmart and you can find them online here. I actually find a reason to go around the long way in my home to the kitchen just so I can walk by my table setting and take it all in. Always make sure you check out the clearance section in Homegoods because I can not believe I found the silver vases for $5.00. I just love them! 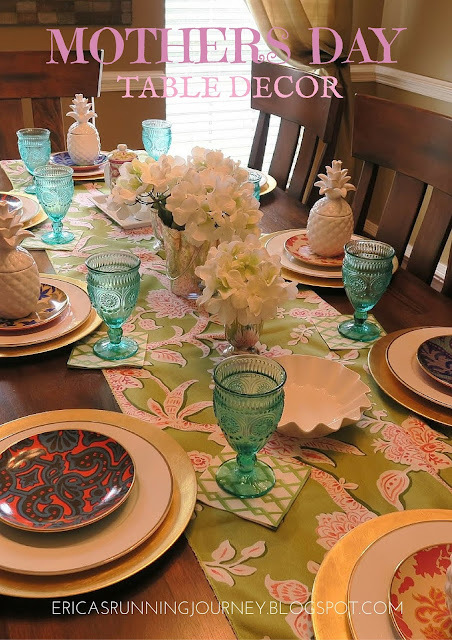 I hope you enjoyed a look at my Mothers Day table collection and what will also be my Summer Table Setting. Take a look below at the video below to see a walk through of everything.